The new stackable Antari F-3 Fazer integrates the features of a rugged flight case in its new packable design. The state-of-the-art air pump system mixes fog and air to produce a fine, dry fog with minimal fluid consumption, for example, one liter of Antari�s FLG heavy fog liquid will provide five hours of continuous fogging. Performance meets reliability in this new design: the extremely dry fog output leaves no residue, and no liquid is left inside the heater, achieving a longer life cycle for this critical component. 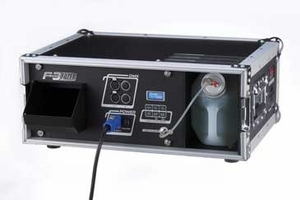 The F-3 also features built-in DMX functionality and silent operation , making it suitable for the widest variety of theatrical and stage applications.